This data set provides a soil map with estimates of soil carbon (C) in gC/m2 for 20-cm layers from the surface to 1-m depth for the conterminous United States. STATSGO v.1 (State Soil Geographic Database, Soil Survey Staff, 1994) data were used to estimate by 20-cm intervals to a 1-m depth the mean soil carbon inventory (gC/m2) for each of the STATSGO-delineated soil map units. These map units are the polygons represented in the provided Shapefile data product. The STATSGO-delineated soil map units encompass between 1 and 26 soil components, representing phases of soil series. Soil series phases represent environmental distinctions within soil series that are relevant to land management, such as slope position and slope steepness (Soil Survey Division Staff, 1993). Each soil series phase within a map unit has been given a high and low value for each soil attribute (e.g., soil organic matter, bulk density, soil layer depth, soil texture, etc.). To generate a baseline soils map, we averaged the high and low values for attributes of each soil series phase, converted soil organic matter content to soil organic C content, multiplied the C content by soil bulk density and by the depth of the respective soil layer, and corrected for the percentage of rock fragments in each soil layer. Soil C was estimated by 20-cm intervals to a 1-m depth, based on soil layer depths and on depth-to-bedrock estimates included in the STATSGO database. A weighted average of soil C was calculated among soil series phases within each soil map unit, resulting in one soil C estimate by depth increment for each spatially delineated soil map unit. Polygons (soil map units) are an area(s), that have the same derived 0-20, 20-40, 40-60, 60-80, and 80-100 cm layer soil carbon values (g C/m2). There is one compressed file (.zip) with this data set. When extrapolated, the .zip file contains one shapefile (.shp). 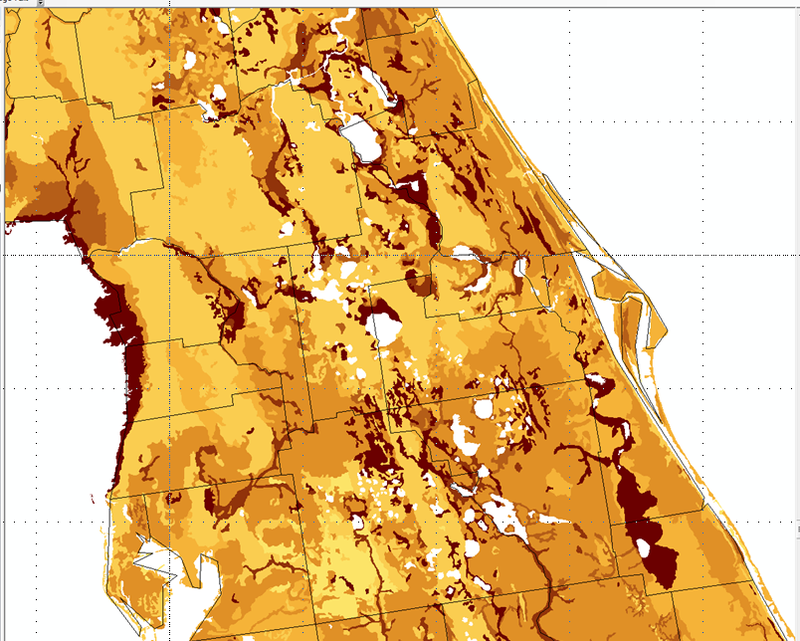 This data set provides a soil map with estimates of soil carbon (C) in g C/m2 for 20-cm layers from the surface to 1-m depth for the conterminous United States. STATSGO v.1 (State Soil Geographic Database, Soil Survey Staff, 1994) data were used to estimate by 20-cm intervals to a 1-m depth the mean soil carbon inventory (gC/m2) for each of the STATSGO-delineated soil map units. These map units are the polygons represented in the provided Shapefile data product. Compilation from published soil databases between 1970/01/01 to 1993/12/30. 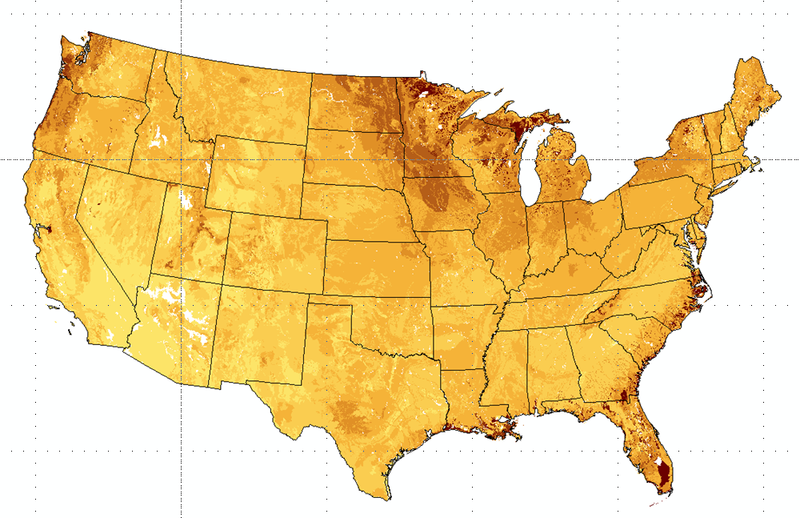 This data set provides one shapefile depicting soil carbon estimates per 20-cm increments to one meter depth for the conterminous United States. Polygons (soil map units) are defined as an area(s) with the same 0-20, 20-40, 40-60, 60-80, and 80-100 cm g C/m2 values. This shapefile contains six files (*.shx, *.dbf, *.prj, *.sbn, *.sbx, and *.shp). USMUID_ Data provider generated ID used in data processing based on STATSGO. No specific reference available at this time. USMUID_ID Data provider generated ID used in data processing based on STATSGO. No specific reference available at this time. MUID Data provider generated ID used in data processing based on STATSGO. No specific reference available at this time. IDS Data provider generated ID used in data processing based on STATSGO. No specific reference available at this time. This soil map with estimates of soil carbon in gC/m2 for 20-cm layers from the surface to 1-m depth for the conterminous United States was derived using methods described by West et al., 2008. This data set represents soil attributes from STATSGO v.1 that were largely collected prior to conservation tillage practices were adopted on US croplands. These soil carbon estimates were used as baseline data for soil carbon change estimates by West et al. (2008). The STATSGO v.1 Soil Survey Manual (Soil Survey Division Staff, 1993) describes the compilation of data and the attributes in the 1993 database. STATSGO v.1 was used to estimate mean soil carbon per polygon in 20-cm increments to 1-m depth. In preparation for the release of STATSGO v.1 in 1994, incorporation of new soils data into STATSGO ceased in late 1993. Of 4,595 complete soil surveys for the contiguous United States, 664 or 14% are from the period 1983 to 1993. Therefore, approximately 86% of soil series data used in the development of STATSGO were taken before 1983 (i.e., before no-till practices became more widely adopted). The STATSGO-delineated soil map units encompass between 1 and 26 soil components, representing phases of soil series. Soil series phases represent environmental distinctions within soil series that are relevant to land management, such as slope position and slope steepness (Soil Survey Division Staff, 1993). Each soil series phase within a map unit has been given a high and low value for each soil attribute (e.g., soil organic matter, bulk density, soil layer depth, soil texture, etc.). To generate a baseline soils map, we averaged the high and low values for attributes of each soil series phase, converted soil organic matter content to soil organic C content, multiplied the C content by soil bulk density and by the depth of the respective soil layer, and corrected for the percentage of rock fragments in each soil layer. Soil C was estimated by 20-cm intervals to a 1-m depth, based on soil layer depths and on depth-to-bedrock estimates included in the STATSGO database. A weighted average of soil C was calculated among soil series phases within each soil map unit, resulting in one soil C estimate for each spatially delineated soil map unit. Soil Survey Staff, Natural Resources Conservation Service, United States Department of Agriculture, US General Soil Map (STATSGO2), available at: http://www.nrcs.usda.gov/wps/portal/nrcs/detail/soils/survey/?cid=nrcs142p2_053629, last access: August 2011. Soil Survey Staff. 1994a. U.S. general soil map (STATSGO). Available at www. ncgc.nrcs.usda.gov/products/datasets/statsgo/. NRCS, Washington, DC. Soil Survey Division Staff. 1993. Soil survey manual. USDA Handbook. 18. U.S. Gov. Print. Office, Washington, DC.